A warmup that got away from me because I love pink! A princess, in original peach flavor. 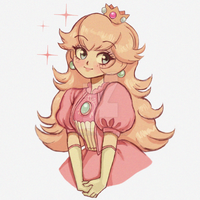 I had a huge crush on Peach as a kid (specifically in Paper Mario - such a cute art style! You get to play as her! You get to bake cakes!!) but I don't think I ever drew her back then - so voila, now I have. Childhood dream fulfilled! This is now available as a print at my INPRNT shop. She looms super adorable, sweet and happy. I love this style it's so warm and lovely. What a delightful picture! She's so bubbly and cute. Everything is bubbly, from the parasol to the strawberries and background! This is so beautiful! Your lines have such a nice flow to them, it really brings this piece to life. I love it! You're welcome! I try my best to write nice comments. Thank you! Haha, and I actually did flip through a bunch of my CLAMP volumes to get ideas on how to draw the skirt - they're so good at ruffles and frills. Good eye! This deserves to be in every Favorite collection. Oh wow this is so pretty!! I love it! 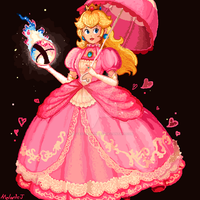 peach is my fave, i love to play her in smash. She looks adorable and perfect!! I really like your take on her design; the added details are wonderful but you've still perfectly caught the essence of the character. This is so cute and I love the little strawberries(?) falling around her! Haha, they started out as the carrot items that appear in some of the Mario games, but I made them a little more peach-colored and a little more heart-shaped... and now I don't quite know what they're supposed to be. They might as well be strawberries! Lovely! The linework looks super fluid and feels organic. Paired with the light, crisp colors, it gives the work an Art Nouveau kind of vibe! 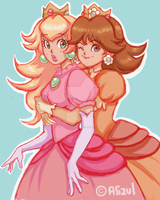 You've perfectly captured Peach's gracefulness.